Does your child, or a child you know, need assistance with identifying bullying behaviors, victim empathy, personal boundaries, or self-control? If so, The Center is here to help. 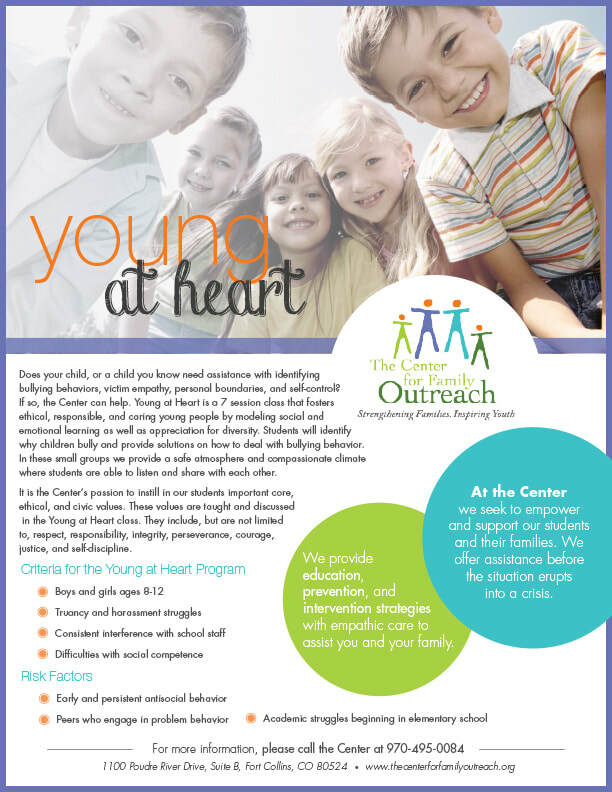 Young at Heart is a 7 session class that fosters ethical, responsible, and caring young people by modeling social and emotional learning as well as appreciation for diversity. Students will identify why youth choose to bully and provide solutions on how to deal with bullying behavior. We provide a safe atmosphere and compassionate climate where students are able to listen and share with each other. The goal of the Young at Heart class is to instill important core, ethical, and civic values. They include, but are not limited to, respect, responsibility, integrity, perseverance, courage, justice, and self-discipline. For more information, please call The Center at 970-495-0084.